Okay, okay . . . . It’s now a month after Rare Disease Day (on which Hyman, Phelps & McNamara, P.C.’s own Frank J. Sasinowski took part in some of the festivities). We’re a little late this year in pulling together and posting on the past year in orphan drug designation requests, designations, and approvals; but better late than never, right? And, in any case, having delayed pulling together this post, we now have the benefit of some rather interesting statistics and information from FDA’s Fiscal Year 2020 Justification of Estimates for Appropriations Committees (i.e., FDA’s FY 2020 Budget Justification), which FDA Commissioner Dr. Scott Gottlieb announced on March 19, 2019 (see pages 102-103 and 113-119 in particular on the Office of Orphan Products Development (“OOPD”)). 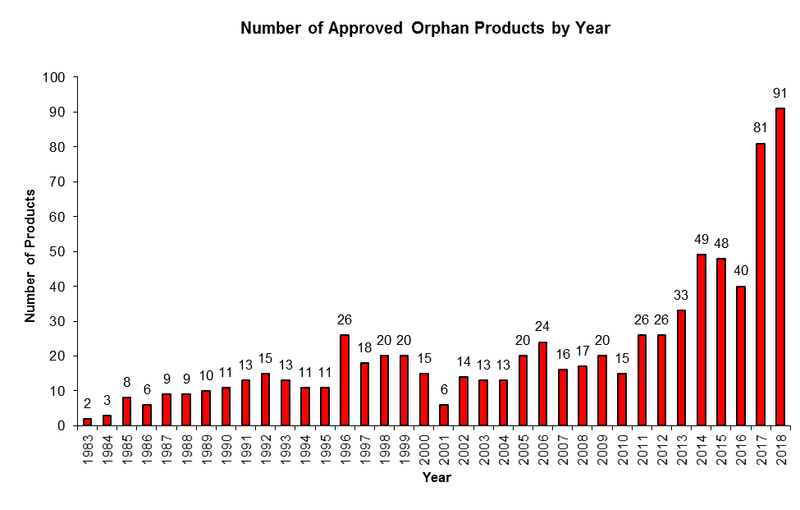 In 2018, which marked the 35th anniversary of the passage of the Orphan Drug Act, FDA’s orphan drug program continued to go strong. Orphan drug designation requests and orphan drug designations dipped compared to 2017 (see our previous post here), but aren’t too shabby. 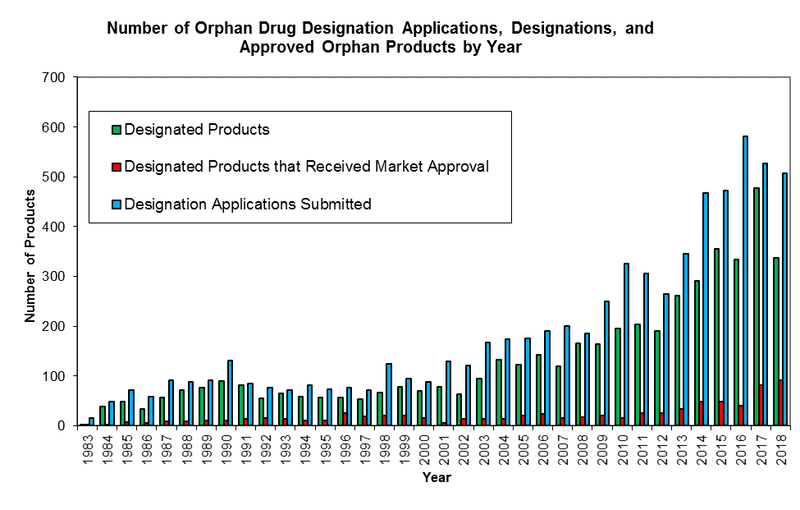 FDA received 507 orphan drug designation requests and 337 orphan drug designations. 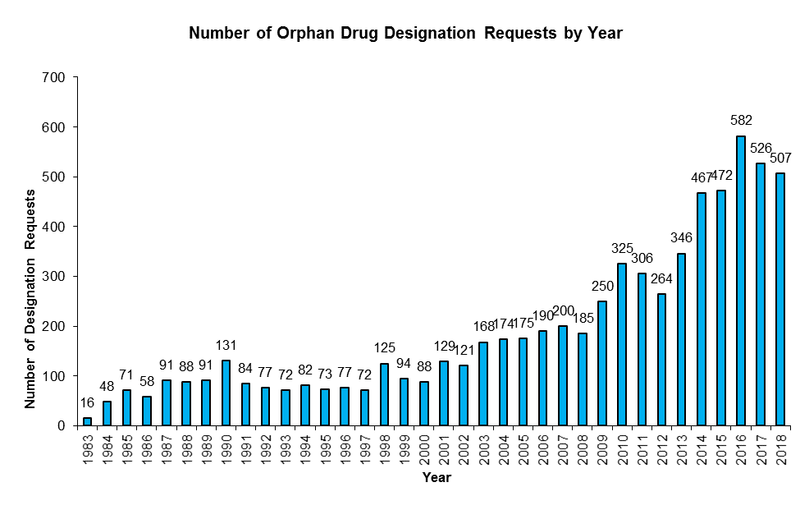 Those numbers are a bit off the previous records of 582 and 526 orphan drug designation requests in 2016 and 2017, respectively, and 477 orphan drug designations in 2017. The decrease in orphan drug designations may be attributed to FDA’s 2017 Orphan Drug Designation Modernization Plan, which cleared a backlog of pending designation requests, leaving fewer to act on. 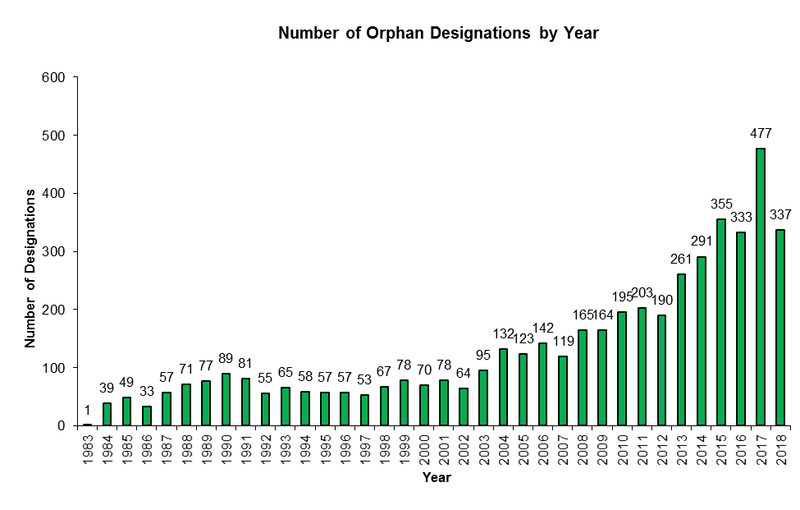 Since 1983, FDA has granted nearly 4,800 orphan drug designations, and has received more than 6,800 orphan drug designation requests. Below are three tables—one for each metric we track—showing the year-by-year numbers since 1983, and a fourth table with combined figures. The numbers are largely based on information from FDA’s Orphan Drug Designations and Approvals Database. FDA will also conduct assessments of current orphan drug incentives, including market exclusivity, to inform FDA’s policy framework around primary and secondary drug indications. Included would be a better understanding of how FDA could best incentivize more drug development for ultra-rare diseases. The requested funding for this initiative will enable FDA to implement advances to support the public health mission of the Agency. OOPD administers major provisions of the Orphan Drug Act and other relevant statutes, where Congress sought to provide incentives to promote the development of products for the treatment of rare diseases and for underserved populations. OOPD incentive program activities facilitate product development innovation and collaboration with private, public and academic entities. Further, the programs directly support the FDA’s Strategic Policy Roadmap priority area to leverage innovation and competition to improve health care, broaden access, and advance public health goals. Despite a significant and growing workload and a critical role to play at FDA, OOPD’s funding has for years been (and will likely remain) flat at a little over $29 million.